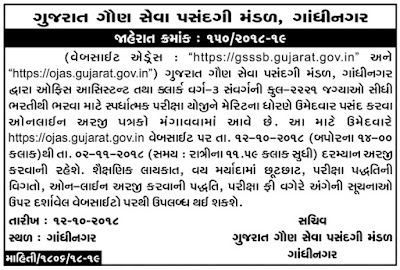 Gujarat Gaun Seva Pasandgi Mandal (GSSSB) recruitment for 2221 Office Assistant & Clerk posts. Gujarat Subordinate Service Selection Board has issued a recruitment notification for the post of the Clerk & Office Assistant. There are total 2221 Vacancies. So, hardworking candidates can apply for this GSSSB Recruitment 2018 by the last date. 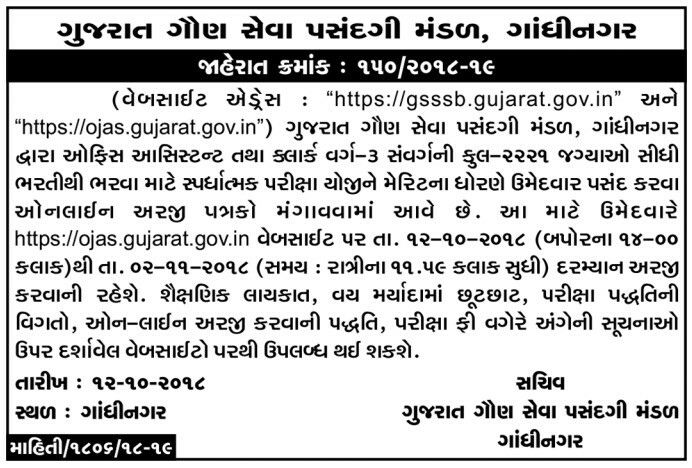 gsssb.gujarat.gov.in or ojas.gujarat.gov.in are the official site to get any kind of information regarding the job notification. Date of Written Exam: to be declared soon. 0 Response to "GSSSB Recruitment for 2221 Office Assistant & Clerk Posts 2018 (OJAS)"